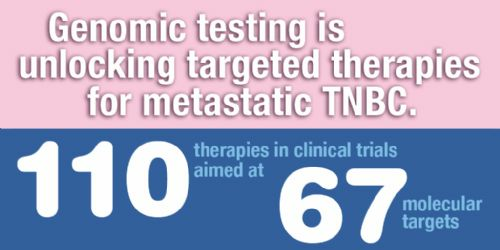 Metastatic triple negative breast cancer patients have access to dozens of personalized therapies through genomic testing. While BRCA 1 and BRCA2 alterations are most common, there are 67 molecular targets being evaluated in mTNBC clinical trials. Molecular testing is part of the screening process for each clinical trial.